AUSG President Yami Payano was honored with an inaugural MLK Service Award. It's almost 4:00 p.m. on a Friday afternoon, and Yamillet "Yami" Payano is still busy engaging with other students. She's tabling in Mary Graydon Center and encouraging people to attend the Spring Cultural Festival the following day. When she gets a break to interview, she keeps right on going-explaining her mission at American University-without skipping a beat. Though clearly high-energy, the AU senior conveys easygoing warmth and affability. Yet she's never had it easy and never takes the easy way out. "I'm somebody who generally loves challenges. I love things that are hard, which is why I'm a math and econ major and a Mandarin minor," Payano says. As she's finishing up the math-econ degree from the College of Arts and Sciences this spring, she's certainly not coasting. Payano won a February special election to serve as Student Government president, and she's working assiduously on other issues affecting the campus culture. "I came to AU with no expectations. I didn't know what I was getting myself into, but I think that it has changed my life," she says now. Payano will only be AUSG president for about 70 days, but she hopes to make meaningful contributions before her term ends on May 1. Since Payano already landed a good job-post-graduation, she'll be a financial analyst for Fannie Mae-she can zero in on her AUSG responsibilities. "I developed a list of things that I wanted to get done-which is ambitious but pragmatic. That's why I'm going a million miles per hour," she says. "I'm coming at this from a place of, 'How can we make this campus better?' As the president, you're an advocate, and what that advocate does is connect students with the right resources." 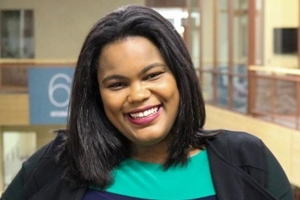 Along with alumna Janethe Peña, Payano recently won the university's inaugural MLK Service Award. It's a recognition of her work on behalf of undocumented students, and her diversity and inclusion efforts in Student Government. Working with Marcy Campos, director of the Center for Community Engagement & Service, they established a Cross Campus Organizing Network with DMV universities to help college students facing uncertainty over DACA (Deferred Action for Childhood Arrivals) and other immigration policies. Born in New York City, she moved with family to the Dominican Republic for her early childhood years. They later returned to New York, where she graduated high school in Harlem. As both a first-generation American and a first-generation college student, she's constantly encountering unfamiliar environments. "Curiosity has been a big part of my life. I think that the reason I am where I am is because I like to ask questions," she says. While in high school, the death of her grandmother sparked a concerted effort to attend college. Since she needed money to pursue a degree, she began applying to every scholarship she could find-about 56 in all, she says. While visiting AU's campus, she was on the phone with her family when a package arrived at home. It was for the Gates Millennium Scholars Program, which would pay for her entire undergraduate education. "My sister-who, keep in mind, is 10 years younger-misunderstood and said, 'It just says congratulations.' And I cried. And I took that as a sign that I should come to AU," Payano recalls. That was just the beginning, as AU required substantial life adjustments. She jokes about being woefully unversed in Washington vernacular. When the college recruiter mentioned AU's proximity to "The Hill," she had no idea what this meant. On campus, she remembers looking for a mysterious hill-was it the one by the Amphitheatre?-before hearing someone say "Congress" and "Hill" and realizing it meant Capitol Hill. Coming from a low-income family left little margin for error, Payano says. She had to get good grades in her classes, because there'd be no safety net if she failed. "I understand that this could change the next generation of my family. So, because of that realization, I work the way I do. And that has sort of guided my entire experience at AU," she says. And she's had many mentors to enable her transformation from unsure college freshman to student president. She found a niche of friends through the (now-titled) Latinx and American Student Organization. She praises Vice President of Campus Life and Inclusive Excellence Fanta Aw, Center for Diversity & Inclusion Senior Director Tiffany Speaks, numerous professors and students, and the Office of Merit Awards that helped her snag five scholarships. "Although my path at AU hasn't been easy, they have taught me how to wine and dine. They have taught me about interviews," she says. "Every single step of the way, I had people at AU willing to help." If adapting to AU took patience, China was almost impenetrable. But, again, she showed a willingness to wade into foreign terrain. She spent a year at Peking University, lived with home-stay parents, and satisfied her minor requirement in Mandarin. "I don't think I ever necessarily acclimated, but I think I learned how to appreciate the culture," she says. Back at AU, she still practices her Mandarin via a language partner and weekly online courses, and she relaxes with Chinese music on iTunes. This week marks the 50th anniversary of the assassination of Martin Luther King Jr., in Memphis. As an inaugural recipient of AU's MLK honor, Payano reflects on the civil rights icon's legacy. And she ponders how King inspires her and a whole new generation of leaders. "I think what made MLK such a great activist was his ability to connect different sectors of society," she says. "And that's what I'm trying to do. We'll hopefully solve a lot of the 21st century problems in a collaborative environment, because we're not moving backwards."